“The Spectacular Now” is this summer’s most original, raw, witty and thoughtful drama about the butterflies and heartbreaks of adolescence…and life itself. Based on the novel by Tim Tharp and directed by James Ponsoldt (“Smashed” 2012), this wholesome coming-of-age drama is bound to touch audiences in more ways than one. Sutter Keely (Miles Teller, “Project X” 2012), is a high school senior and Mr. Popularity. He’s a true charmer with a side of swagger but beneath the surface he has a few skeletons in his closet, one being that he’s an alcoholic. We meet him as he’s working on his candid college application essay, raving about ‘the best girlfriend’ that he just lost, Cassidy (Brie Larson, “21 Jump Street”). After being dumped by Cassidy, he unexpectedly falls for “the good girl” Aimee Finecky (Shailene Woodley, “The Descendents” 2011) – straight-laced, shy and innocent. While getting to know Aimee, several layers are removed and Sutter transforms while trying to reconnect with his absent father (Kyle Chandler, “Zero Dark Thirty” 2012) – in the end, audiences will determine if it’s for better or worse. Incredible performances by Woodley, Teller and Chandler and a supporting cast to match: Brie Larson, Jennifer Jason Leigh and Mary Elizabeth Winstead. Woodley and Teller have the perfect chemistry and the faces that (should always) go along with it. It’s refreshing to see characters that actually look the age of the part they’re playing. Chandler, who audiences are used to seeing as the grounded, reliable father and coach in “Friday Night Lights” essentially plays the opposite character in the film. It is almost as if the story was torn directly out of a diary and the actors are bringing it to life. There is no formula here. “The Spectacular Now” is deep and serious with the perfect amount of sly comic relief. Audiences will find this film relatable in various ways – whether it be the family upbringing, pressures of high school, young love or the relatable characters. Tim Tharp’s book of the same name was adapted by Scott Neustadter and Michael Weber (“500 Days of Summer”). Ponsoldt’s skilled execution of the script was spot on. I had the opportunity to screen this film at the Chicago Film Critics Film Festival in April where Ponsoldt opened up about the film’s “behind the scenes” during the Q&A session. Shot in Athens, Georgia, Ponsoldt’s hometown, the cast endured the heat wave of summer. 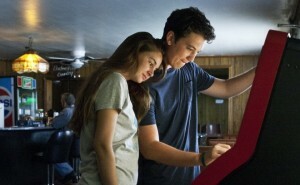 “The Spectacular Now” is actually the first major motion picture to be shot entirely in Athens. Ponsoldt referred to the film as a “romantic tragedy” where audiences fall in love with the chance that Sutter and Aimee fall in love with each other. He noted the heavy concept of Sutter’s alcoholism corrupting and damaging Aimee. What set this film apart from other high school movies was also the lower class setting. “This isn’t going to be a movie with Abercrombie & Fitch models running around in wealthy suburban neighborhoods,” said Ponsodlt. Woodley caught Ponsoldt’s eye in “The Decedents,” saying that she had the ‘girl next door,’ Sissy Spacek vibe and ironically, Woodley read the script before Ponsoldt. Teller’s performance in “Rabbit Hole” was incredibly stoic and his role in “Footloose” charismatic. Since Teller’s toxic character required a multitude of personas – charm, seduction, sarcasm, vulnerability and danger – he already had one foot in the door upon auditioning. Ponsoldt discussed several specific scenes but his favorite of all was shooting in the forest where Aimee and Sutter begin to open up and eventually, they have their first kiss – an incredibly raw scene. He went on to say the love scene is not objectified – rather awkward and realistic. Ponsoldt directed using long takes, which is where much of the improv originated. Bottom Line? Incredible performances, raw emotion, thoughtful story; nothing short of spectacular.